photo-eye Gallery Interview: Chaco Terada Gallery Associate Savannah Sakry reaches out to Japanese artist Chaco Terada for more insight into her mesmerizing works on silk featured in our current exhibition Rendezvous with Light. photo-eye Gallery's current exhibition, Rendezvous with Light has been extended through the new year until January 20th. If you are not yet familiar with photographers David H. Gibson and Chaco Terada we invite you to please come by the gallery and see these exquisite prints in person - they are not be missed! To follow Gallery Associate Lucas Shaffer's interview with David H. Gibson, we asked Gallery Associate Savannah Sakry to reach out to Japanese artist Chaco Terada for more insight into her mesmerizing works on silk. While Terada's one-of-a-kind pieces render as personal visual poems, her themes are universal in regards to the business of being human. 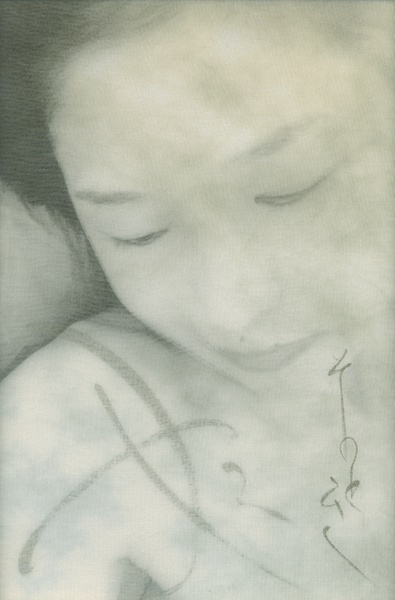 Motifs of love, loss, family, and life's journey run deep, similar to the multiple layers of silk, images, and Sumi ink used to create her works. 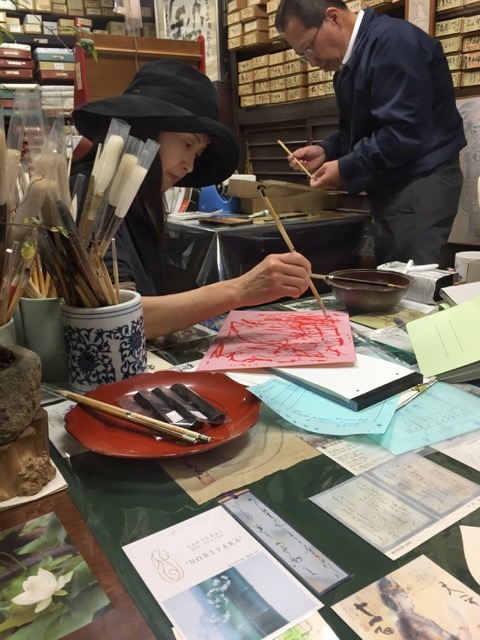 Terada testing brushes at favorite calligraphy shop on a recent visit to her native Japan. 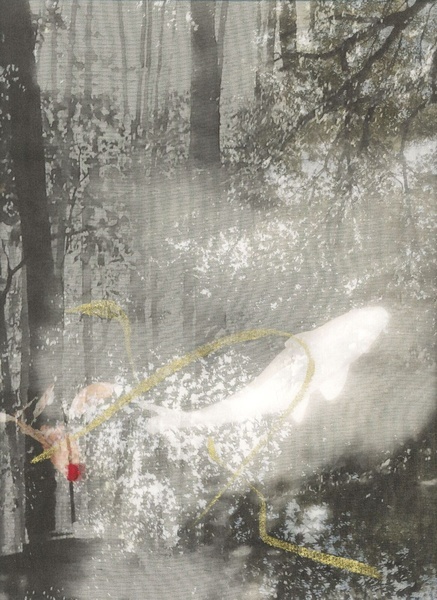 Savannah Sakry: What drew you to incorporate silk with your photographs, or was it that you decided to incorporate photography into your works on silk? 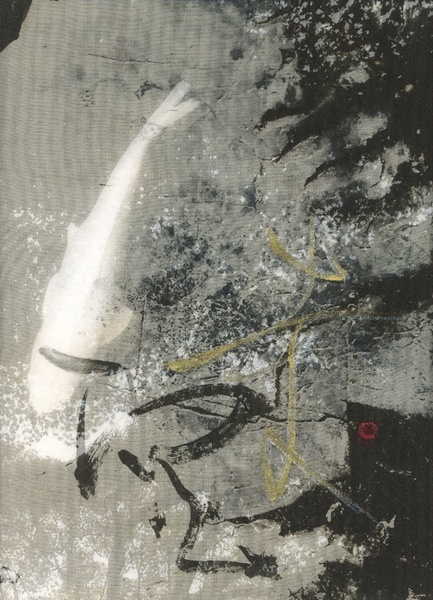 Chaco Terada: I decided to incorporate photography into my artwork on silk. I was seeking ways to express calligraphy as an art form. SS: Your use of calligraphy is more an artistic and expressionistic approach – not to be interpreted as traditional Japanese calligraphy. 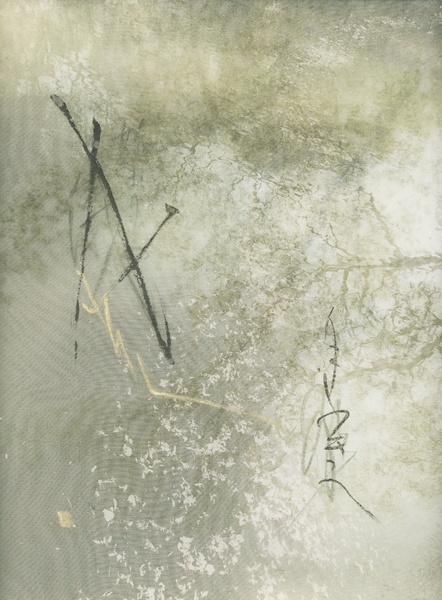 When did you first begin experimenting outside the boundaries of traditional Japanese calligraphy? CT: After I moved to the USA over 20 years ago, I received instructor qualifications of Chinese and Japanese calligraphy and I took steps toward finding my own expression. SS: I understand your process is meditative, organic - there is no formula, your workflow is intuitive. Would you say your process is also healing or centering for you? CT: Yes, it happened to be a very healing process during the creation of the works in the exhibition. I was experiencing fear of death in addition, to the emotional pain from childhood. SS: What moves you or inspires you? Specifically which photographers have been the most influential? CT: I pay attention when I see the similar taste in someone’s photograph. I would not be influenced by it because I already have it. My works come from own experiences of daily life. Every day, I observe how all the elements surround me and interact with my feelings. The time comes when I naturally start making artworks. SS: Do you have a favorite piece in the exhibition? If so, which one and why? CT: I would not use the word “favorite” but the work called “Dew 1” came to my mind. I had a unique experience with it. In the beginning, it was a casual self-portrait but when I saw my mother in it, everything changed. An old picture, of my young mother holding her newborn baby in her arms, mirrored my self-portrait. I returned to being that baby in her arms. My mother was making eye contact with me. I was trying to see the warm light falling from the above. Tears warmed my heart, became gentle rain over me. I hear her life commitment with this little one and she kept it up to now. That was it. All hard drama in my life was based on love. It started as Love at first sight. I wrote my mother a letter to say thank you for giving all her life to protect me. I finally see it - love was there, it was always there! This portrait shows this woman is in love with the world she is in. SS: Your work explores many themes such as nature, light, time, origin, and reflection. Is there one theme, in particular, you feel your work encompasses the most? CT: It could be “life”. All my mystery, wonder, and excitement are there. SS: I love that each work is unique or one-of-kind and typically from a series of two to five pieces. When do you feel a series or individual piece is completed? CT: Usually, the original photo gives me the final image. When I can manage the harmony in brush, ink, silk, and image to approach to that image I can sense the completion. When the photo gives me a poetry or a story it becomes a series. My sense will find the end of them. SS: What advise can you offer other artists and photographers? CT: Sorry Savannah, I have no idea what to say to other artists. To me, they are already the masters of their ways.